GOODBYE WITTGENSTEIN takes a roman­tic love affair bet­ween the Aus­tri­an-Bri­tish phi­lo­so­pher Lud­wig Witt­gen­stein (1889 – 1951) and his young fri­end David Hume Pin­sent (1891 – 1918) and the 1913 most­ly in Bir­ming­ham writ­ten “Notes on Logic”, the pre­de­ces­sor of the Trac­ta­tus Logi­co Phi­lo­so­phi­cus, as a star­ting point for a series of works in public space in Bir­ming­ham and Linz. As part of an exchan­ge pro­gram bet­ween artists and sci­en­tists from both cities real and fic­tive sto­ries are inter­wo­ven to revi­ve Witt­gen­stein. In Sum­mer 2016 qujOchÖ will visit Bir­ming­ham to inter­vene at dif­fe­rent pla­ces that are con­nec­ted to the life of Witt­gen­stein and Pin­sent. The work will be pre­sen­ted in a public talk at BOM Bir­ming­ham Open Media and at the mon­th­ly art event Dig­beth First Fri­day. In Novem­ber 2016 a group of four artists around A3 Pro­ject Space will come to Linz, whe­re Witt­gen­stein visi­ted the tech­ni­cal ori­en­ta­ted “K.u.k. Real­schu­le” bet­ween 1903 and 1906. Emi­ly War­ner, Tre­vor Pitt, Pete Ash­ton and Mike Johnston will use their resi­dence at Ate­lier­haus Salz­amt and quitch the­re to go on the trail of the phi­lo­so­pher. Sound Art in public space: 6 speakers. 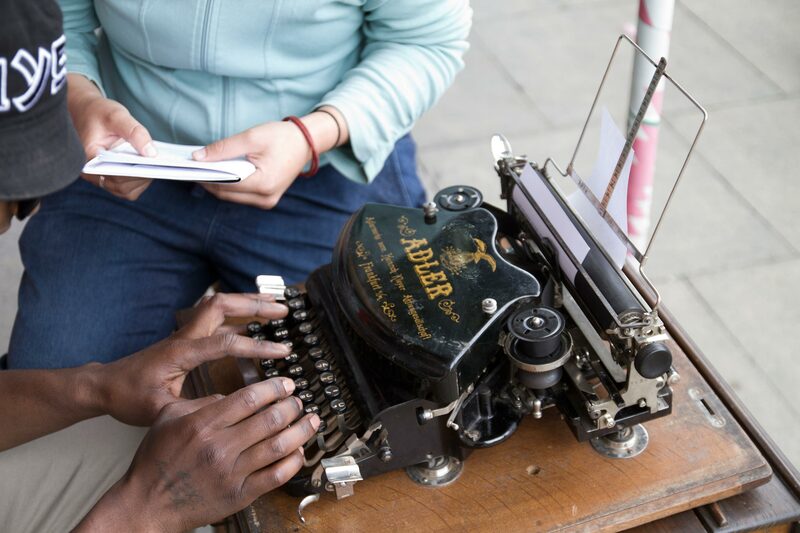 Per­for­ma­ti­ve art in public space: old table with fold out stool, typewri­ter Adler No. 7 from 1911, paper, pen­cils, examp­les of pho­ne­tic tran­scrip­ti­ons, audio record­ings. Media art: post­cards, stamps, pen­cils. 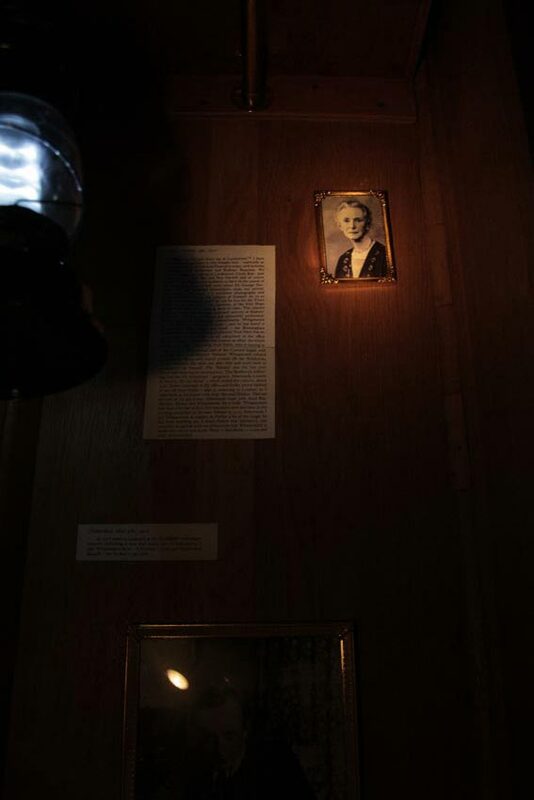 Instal­la­ti­on in public space: antique woo­den ward­ro­be with mir­ror, color chan­ging LED heart, pho­to­graphs, excerpts from dia­ry, flash­light, voice record­ing of spo­ken let­ter. Instal­la­ti­on in public space: old woo­den lad­der, two par­rots, two par­rot cages. 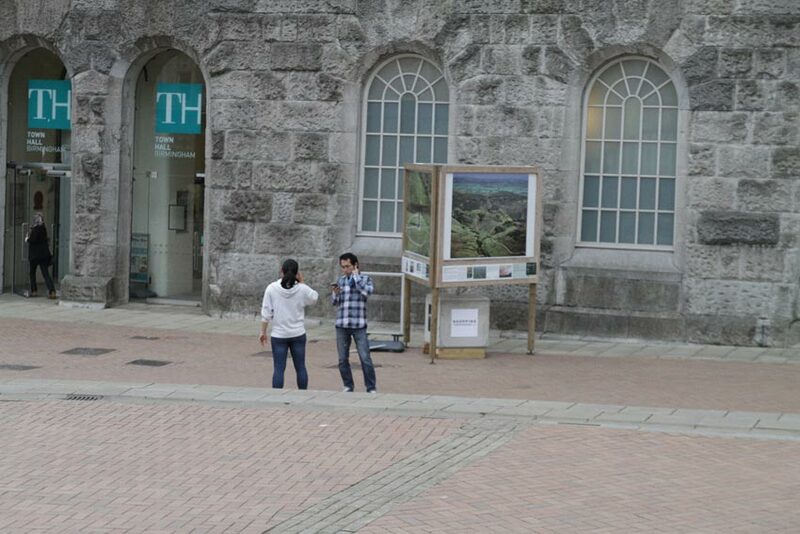 Par­ti­ci­pa­ting in the mon­th­ly art event Dig­beth First Fri­day qujOchÖ pre­sen­ted the out­co­me of the inter­ven­ti­ons rea­li­zed in public space at the end of their stay in Bir­ming­ham. All five works have been re-enac­ted in the exhi­bi­ti­on space of the off space gal­le­ry Stryx. The near­ly 300 visi­tors could once again enter the ward­ro­be to lis­ten to Ellen Pinsent‘s voice, step up the lad­der to watch the par­rots say­ing „Logic“ and „Love“ on screens, type a dic­ta­ti­on of notes on logic in Ger­man on the old typewri­ter, feel or even hear Richard Strauss‘ Salo­me in the sound-instal­la­ti­on or finish the let­ter to David Pin­sent. The very last Tri­en­ni­al Music Fes­ti­val in Bir­ming­ham at the Town Hall was atten­ded not only by the gre­at and the good of the city, but also by the young Lud­wig Witt­gen­stein and his young fri­end David on Octo­ber 4 1912, during his first visit to Bir­ming­ham. Besi­des others the con­certs fea­tured excerpts from Richard Strauss’ ope­ra „Salo­me“ which Witt­gen­stein avoi­ded and Pin­sent deemed „rot“. The ope­ra its­elf – writ­ten by Oscar Wil­de – was not wit­hout con­tro­ver­sy at that time. Witt­gen­stein refu­sed to lis­ten to „Salo­me“, was annoy­ed, left the Town Hall and stood out­si­de. For this inter­ven­ti­on parts of the per­for­med ope­ra at the Tri­en­nia­le were modu­la­ted into ultra high fre­quen­ci­es and per­for­med all around the Town Hall on July 29 2016 bet­ween 6 and 9 pm. The mul­ti-chan­nel sound instal­la­ti­on tur­ned the final sce­ne of „Salo­me“ into a con­tro­ver­si­al pie­ce of sonic wea­pon, in par­ti­cu­lar for the youn­ger audi­ence. 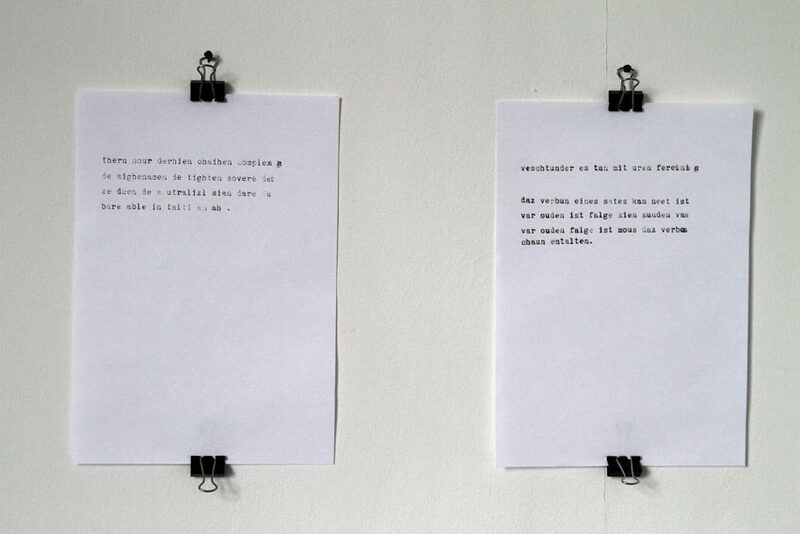 On Octo­ber 7 1913 Lud­wig Witt­gen­stein dic­ta­ted „Notes on Logic“ at the Ber­litz School of Lan­guage in 32 Para­di­se Street. He reci­ted his work on logic in Ger­man lan­guage. 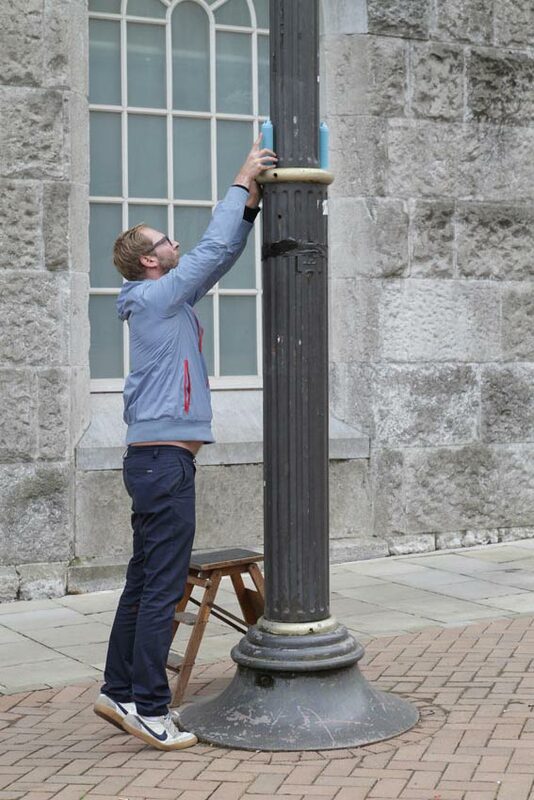 For this work pas­sers-by in Para­di­se Street had been stop­ped and asked to re-enact the dic­ta­ti­on. Sit­ting on a table they were asked to type down what they pho­ne­ti­cal­ly heard of „Notes on Logic“, read in Ger­man lan­guage, by using an old typewri­ter. After­wards the peop­le read aloud their own notes on logic, which was audio recor­ded. Cor­re­spon­dence from David Pin­sent to Lud­wig Witt­gen­stein pla­ces David lod­ging at 105 Har­bor­ne Road, Edg­bas­ton in Bir­ming­ham, in sum­mer 1914. The house was run by Miss Ger­tru­de Dale who was a fri­end of the Pin­sent fami­ly. 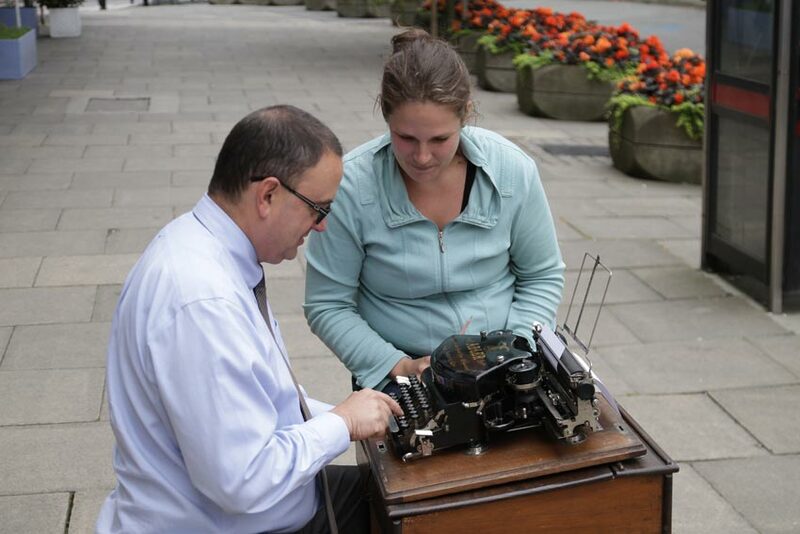 In a series of let­ters in June and July David expres­sed the hope of see­ing Lud­wig again around August 1914. The last time they had seen each other was in Octo­ber 1913, when they said good­bye befo­re Witt­gen­stein left to live in Nor­way. Both had been plan­ning to holi­day tog­e­ther again but with the out­break of hos­ti­li­ties it was never to be, and they would never see each other again. David Pin­sent died in an air­pla­ne acci­dent in May 1918. What could have been the most important thing Witt­gen­stein was not able to tell Pin­sent befo­re he left Bir­ming­ham? This work invi­tes peop­le to finish Ludwig‘s let­ter to David and send the pre­paid post­card to the cur­rent owner of 105 Har­bor­ne Road, 80 year old Mr. Tho­mas Andrew Dono­ghue. The collec­ted post­cards will be pre­sen­ted at a later time. David‘s father Hume Pin­sent curtail­ed his reti­re­ment during the First World War and retur­ned to Pin­sent & Co. He and his wife Ellen lived in Litt­le Wick, a cot­ta­ge in the grounds of Sel­ly Wick House, the home of Hume‘s bro­ther Richard. The instal­la­ti­on con­sisted of an antique woo­den walk-in ward­ro­be pla­ced on the pave­ment of Sel­ly Wick House. Insi­de the­re was com­ple­te darkness. A stran­ge atmo­s­phe­re bet­ween anxie­ty and inti­ma­cy spread. Ran­dom pas­sers-by were asked to enter the ward­ro­be. By doing so and sit­ting down insi­de of the ward­ro­be the voice of an old woman could be heard rea­ding the let­ter from Ellen Pin­sent to Witt­gen­stein with a noble Bir­ming­ham accent. By using a flash­light the insi­de of the ward­ro­be could be exami­ned to dis­co­ver pho­tos and selec­ted dia­ry ent­ries of the beloved David. 44 Lords­wood Road was the fami­ly house of the Pins­ents‘. 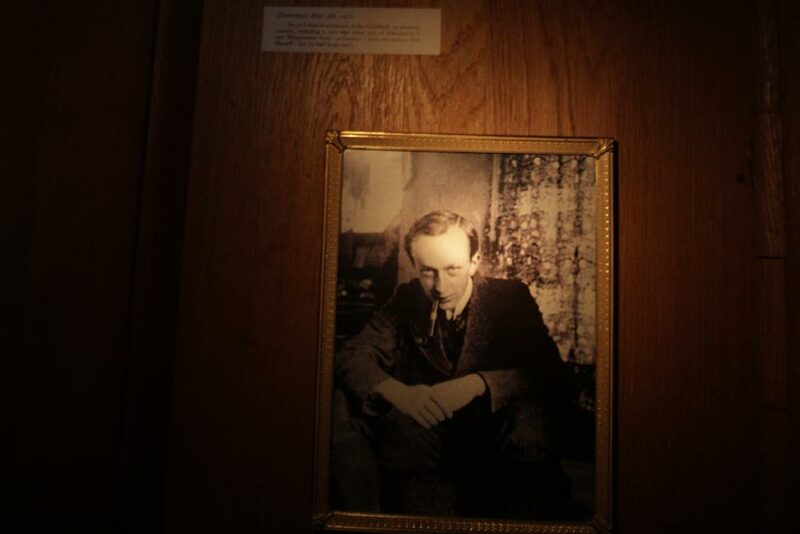 Witt­gen­stein stay­ed here twice – once from Octo­ber 4 to 5 1912, on his return from a holi­day with David Pin­sent in Ice­land and once from Octo­ber 6 to 8 1913, after holi­day­ing with David in Nor­way. Octo­ber 8 1913 is also the last time the two fri­ends saw each other. 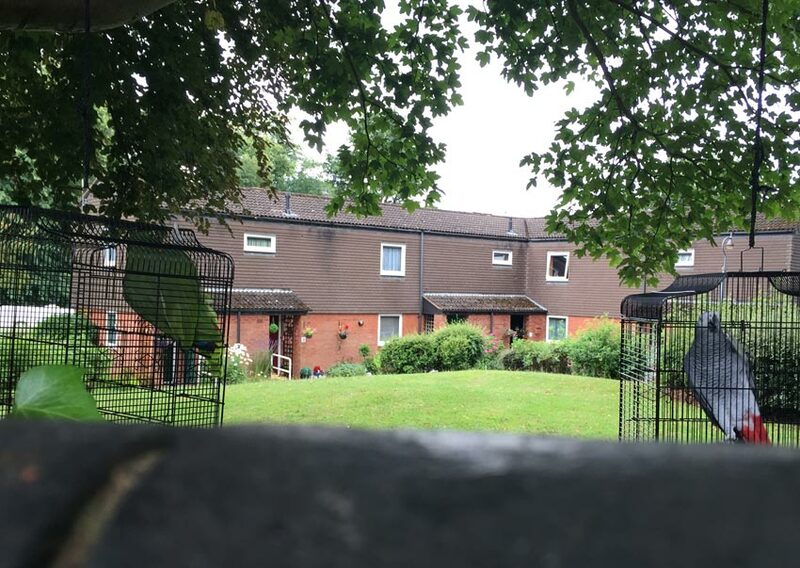 Apart from a small sec­tion of the bounda­ry wall on Lords­wood Road and two old trees, the home of the Pin­sent fami­ly has been demo­lished and rede­ve­lo­ped as Wea­ther Oaks, built in the 1970s. This work refers to the inter­nal strugg­le of Witt­gen­stein and Pin­sent and their life bet­ween rea­son and emo­ti­on, to „Notes on Logic“ and to the famous last part of the „Trac­ta­tus Logi­co Phi­lo­so­phi­cus“. 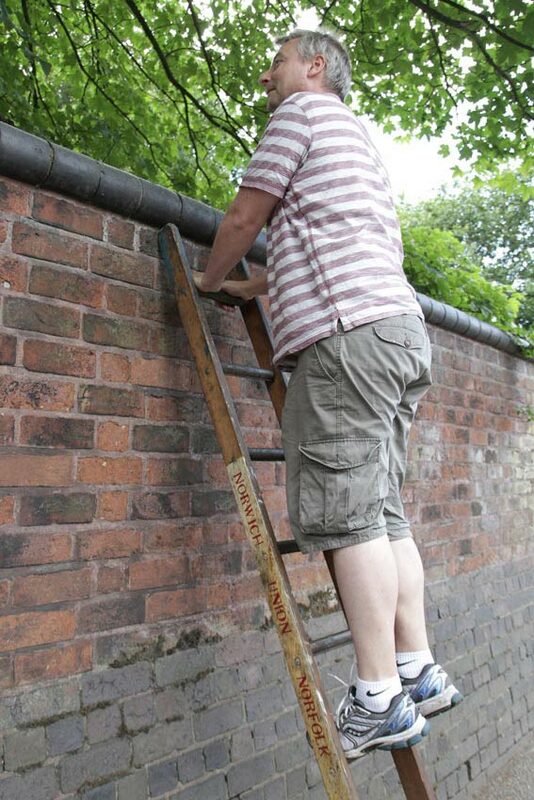 An old woo­den lad­der was lea­ned against the wall of 44 Lords­wood Road. Behind the wall one could hear two stran­ge voices, one yelling the word „Love“, the other one yelling the word „Logic“. By step­ping up the lad­der and pee­king over the wall one could see two par­rots in cages tal­king to each other. Whe­re­of one can­not speak, the­re­of one must be silent. Logic and Love are incom­pa­ti­ble.